** PET OF THE WEEK ** What’s black, brown and sweet all over? Give up? Me! 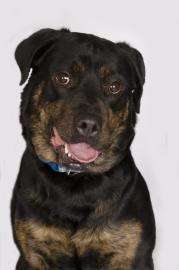 My name is Baby, and I am a very friendly Rottweiler mix. I love other dogs, and of course I love people. I was surrendered with my sister Sadie (a dachshund) because our family was no longer able to care for us. Sadie was recently adopted, so now I need to find my forever home! I am a real gentle dog and have so much to offer. I have good manners and walk well on a leash. Please stop by and visit with me soon! what a cutie, hope Baby finds a furever home soon!